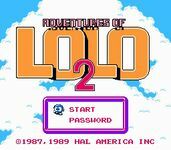 Adventures of Lolo 2 is the sequel to Adventures of Lolo. You goal is to save the princess by making your way through 50 different puzzle rooms. Game play is very close the original Adventures of Lolo but the difficulty is higher.